“We forge the chains we wear in life“. It’s a quote my Mr Charles Dickens, and by all means, we do tend to believe so. Strings and chains in life have devoured more things than we could have even imagine. All this may be relied to many reasons, but most commonly the thing that restrains us from doing and being is fear. Fear to embrace the world that actually lives in us, fear to become ourselves, to speak, to think, to construct all that is in our hearts and heads. The fear to develop the material and non-material world. The fear to extend. But since there is a problem, there is a solution. We started with this Dickens’ quote because the next project is connected in some way with him. It’s a story of boldness. The boldness to face all that we mentioned up above. To be yourself and hence you could empower the needs and strives you have. To extend life in all meanings. This particular project has become the home of a Charles Dickens’ illustrator, which has been transformed into an artist’s studio by Sevil Peach. 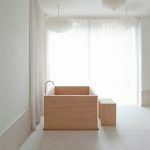 Architecture studio Sevil Peach has overhauled a house once owned by Victorian painter and illustrator Frederick Barnard to create an artist’s residence boasting period features and a patio-side bathtub. It is a grade-2 listed brick building and one of the clusters of artist’s houses constructed in 1873 for Barnard. Some of his include illustrations to some of the books of Charles Dickens, and the novels, published between 1871 and 1978. 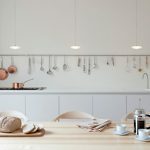 It’s a project which consists of both history and contemporary elements of a comfortable dwelling. 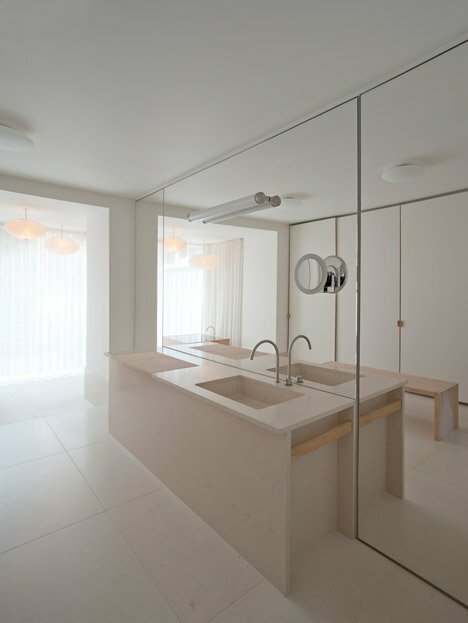 The minimalistic features which attract here are simple and in the same time well-detailed. 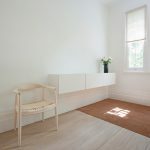 So the London studio Sevil Peach had the mission to convert the lower floors of one of the historic home, located in London’s Primrose Hill, into a single residence containing an artist’s studio. 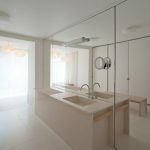 Architects were tasked to strip away the internal divisions of the downstairs property to open up space and reveal features. This includes oak beams and sash windows- mesmerising in their simplicity, which makes them adorable for the inhabitants. The spaces in this house appear in distinctive layouts, which concealed the original spirit and structure of the building and its special concepts. The brick construction includes a generous bathroom, spacious terrace for the kitchen which makes the whole picture more alive, less complexed and with a renovated feeling at the same time. There is a split level between the lower and upper floors, which is purposed for the painting studio. 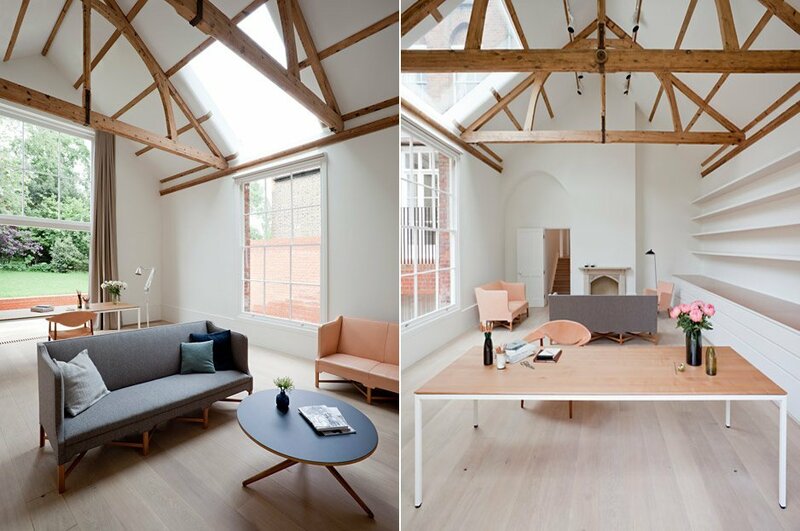 Here the architects have brought out the historical and emotional elements of the original oak ceiling beams and frameless replacements for a 1960s skylight. 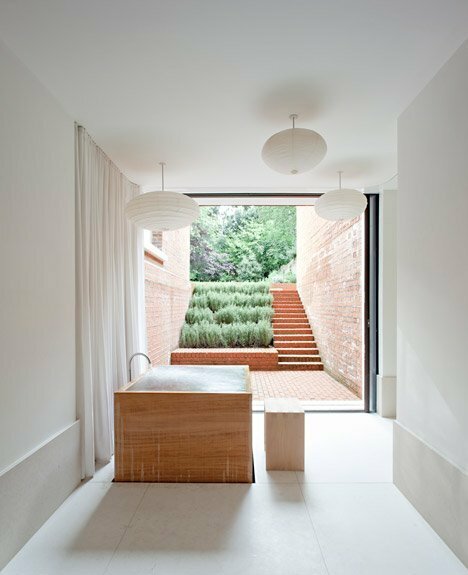 The wooden steps lead down from the studio into the master bedroom, where there is also the bathroom and the dressing room. 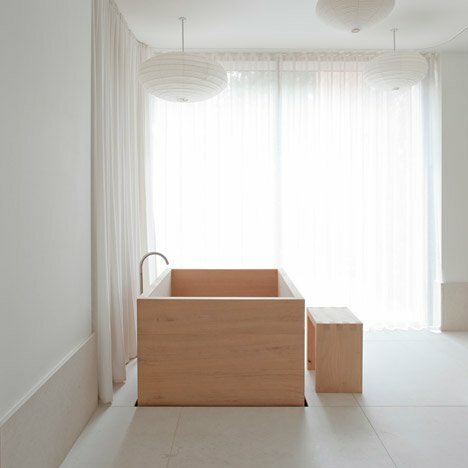 The bathtub is made of wood and sits by a glass wall, which is made such that it can slide the full width of the extension onto an adjoining patio. The kitchen is what is should be. Upstairs, with basically white colour range walls and wooden elements- it exemplifies the purity of time passed. 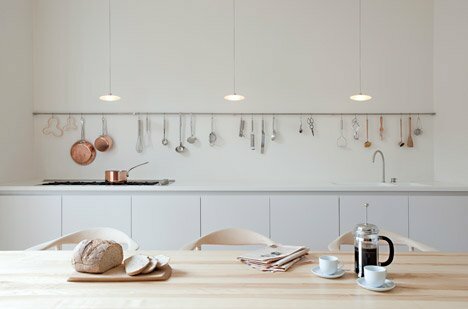 Light is rich and embodied in every single item in the dwelling’s room. 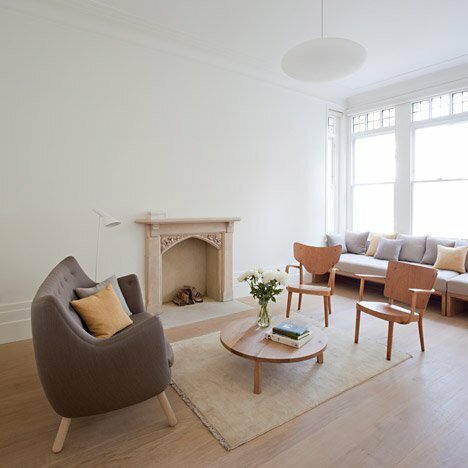 The living room, full of light as well could be rearranged into a simple guest room by an easy repositioning of some of the furniture. External steps- the result of a 1960s refurbishment were replaced with more minimalistic and contemporary steel staircase with copper handrails. 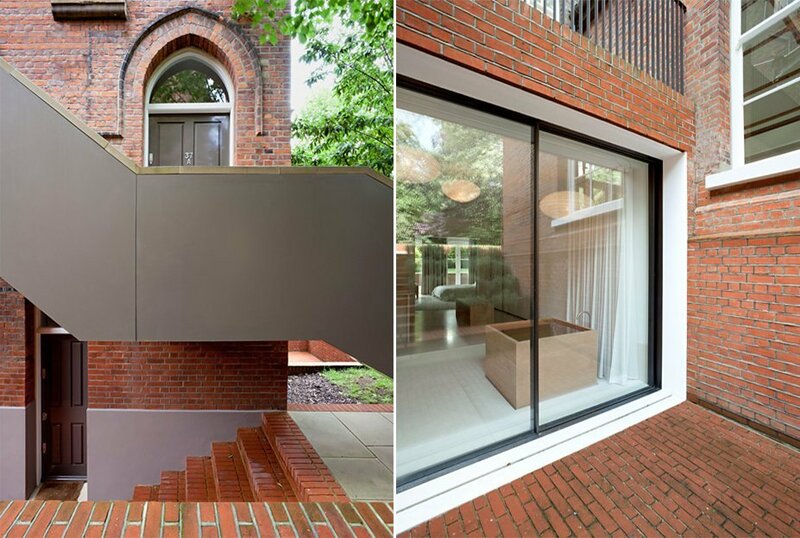 Matching and in the same time contrasting the brick detailed structures. It’s like a poem that says “remember how it used to be”. And by poem, we do really mean poem, which one could connect not only with history, literature and sentimentalism but also with himself literally. To finalise all that beauty one must think that there are things in life, which are intransigent and eternal. And one will be absolutely right. No matter that it is history or human knowledge this place has preserved the energy of an era and a way of thinking that still touches our contemporary world with its simple features. Features which have taught and empowered with invisible energy, generations before we have set an eye on this project.